Taiwan has denied donating more than a million US dollars to help fund the Swaziland King’s 50th birthday celebration. However, a newspaper in Swaziland published a photograph of the cheque being handed over. The Central News Agency in Taiwan reported the Ministry of Foreign Affairs denied a report from Swazi Media Commentary that it had paid US$1.7 million towards the 50/50 Celebration on 19 April 2018 that will mark King Mswati III’s birthday and the 50th anniversary of Swaziland’s Independence from Great Britain. The report appeared on a number of news sites. The Taipei Times using the agency report said on Thursday (12 April 2018), ‘Democratic Progressive Party (DPP) Legislator Tsai Shih-ying asked Minister of Foreign Affairs Joseph Wu about the allegations during a meeting of the legislature’s Foreign and National Defense Committee. In fact the figure donated was US$1.3 million. Swazi Media Commentary sourced its report from the Swazi Observer of 8 February 2018. The report included a photograph of a cheque for US$1,307,865 (the equivalent of E15 million in Swazi currency) being handed over by the Taiwanese embassy in Swaziland to the Swazi Minister of Home Affairs Princess Tsandzile and Minister of Economic Planning and Development Prince Hlangusemphi. 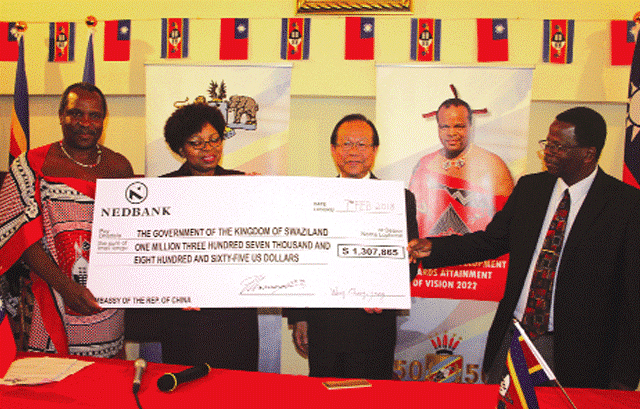 Picture from Swazi Observer shows the cheque being handed over by Taiwan Ambassador Thomas Chen.